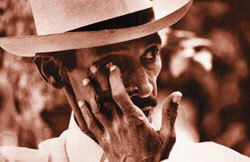 The author of the known song Guajira Guantanamera is known as the King of the Melodies. The 11th of October 1979, died in Havana Joseíto Fernández, the author of the known song Guajira Guantanamera, the most universal Cuban song today, with over one hundred versions. Joseíto Fernández, sang in trios, sextets and typical orchestras. In the peak of the danzonete rhythm he sang with the Raimundo Pía y Rivero orchestra and then in front of his own group. The famous Guantanamera, was born in 1928, when he directed a musical group that closed a local radio program in the capital. The group was dedicated to tell passion dramas and human tragedies with a rumba and he decided to change the music. He had the idea of adding improvised letters according to the events of the day, almost always inspired in the so called "red chronic" of the time. According to a story made by Fernandez, the definitive decision of putting the melody the name "Guajira Guantanamera" came when the singer fell in love with a girl from Guantanamo city. In a start, he sang it, improvising in letters the gifts of the women from the different areas where the dancing parties took part, but at the end, for sentimental reasons, it was the one dedicated to the women from Guantanamo, a the own creator said. The "Guajira Guantanamera" has inspired over 150 versions by famous Cuban and foreign singers, among them the US singer Pete Seeger, who in 1963 made a version of the song in which he included several verses of Jose Marti. Joseíto Fernández was, also, somebody who made out of simplicity a way of daily performance. He was also the composer of several boleros and guarachas, such as "Elige tú, que canto yo", "Amor de madre", "Demuéstrame tú" y "Así son, boncó".